Are you ready to give slow cooking a try? 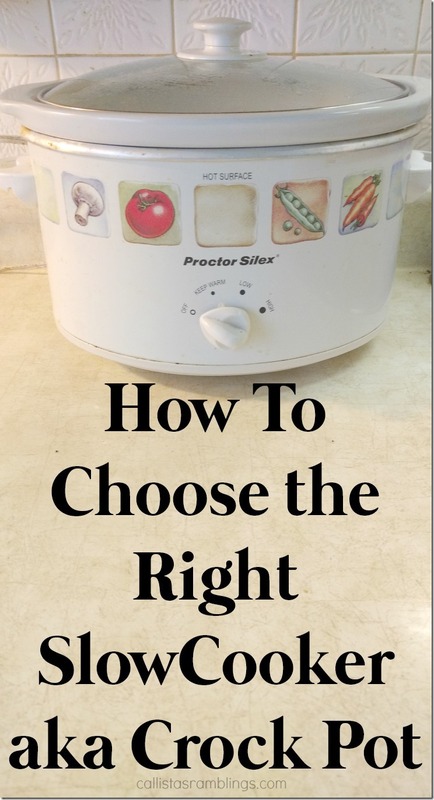 There are lots of kinds around and so I want to help you with How to Choose a Slow Cooker. Wouldn’t it be wonderful to make a filling, delicious meal without having to spend hours in the kitchen stirring pots? You can make meals that taste like you’ve slaved for hours over the stove, when all it really took was dumping a few ingredients in your slow cooker and turning it on. And since you’re only using one pot, clean-up is a breeze as well. Check out our Slow Cooker Buying Guide below. This post contains affiliate links. If you make a purchase through one of these links I will make a small commission. If you already have a slow cooker you might not need a new one. Try it out and see if it works and if it has what you need. We’ll talk more about add-ons later and you’ll want to know if you need any of those. How many people are you feeding? If you are planning on making mostly main meals, soups and stews for a family of four to six people, a six quart model will be your best bet. If you’re doing a lot of cooking for crowds (church potluck anyone?) or you have a big family, you may want to go with a bigger model. And if you’re cooking for two, or only plan to make side dishes and desserts in the slow cooker, a four quart one will suffice. If you’re not sure what to get, stick with the standard six quart version. I have a family of 7 and our 6-quart is really too small. I can only make the main meat usually, instead of the whole meal. I need to invest in a bigger one. The post popular brand is Crock-Pot. It’s so popular that a lot of people call their Slow Cooker a Crock-Pot even if it’s a different brand. Other brands, Hamilton Beach, Cuisinart, and Kitchen-Aid. Cheaper brands are okay, especially if you won’t be using it much. However sticking with a popular brand will make it easier to find parts down the road, should the lid fall and break, for example. What About a Used Slow Cooker? Do you really need to buy a new slow cooker? It’s perfectly fine to look for a used model. You can find them very inexpensively at your local thrift store. You may even be able to get one from a friend. So many people have a slow cooker sitting in the back of their kitchen cabinet and never use it. Ask around, you may get lucky. There are some fancy slow cooker models on the market today. And there are some very affordable basic models that function with no more than a high or low cooking feature and they may do everything you need your slow cooker to do. Timer that counts down so you can coordinate side dishes. Take a look at what’s on the market and decide what you can and can’t live without. If this is your first slow cooker, start with a very basic model. You can always add another one with more features down the road. When I first heard of someone having more than one I thought it was crazy. But now I understand that with more than one you, you can cook more than one thing at the same time. This is perfect for the holidays. Some meals can’t be done all in one pot. For example pulled pork in one and Mac & Cheese in the other. Also having a smaller model in addition to your bigger one is good for hot dips or appetizers. If you know how to choose a slow cooker you can check out ones on Amazon below. After your purchase, make sure you read the manual to learn how all the features work and then get cooking!